BODYHARMONIE OFFERS INSTANT HEALTHCARE REBATES! BODYHARMONIE Massage Therapy is registered with the reputable 'Massage Australia' and 'AAMT' Associations and as such, massage health rebates are recognised for most health insurance providers - making it easier and more economical for you to look after your health and your body. We also provide remedial massage treatments for workers compensation claims that are approved by Workcover NSW. Please speak with us before booking your appointment for all Workcover NSW claims as some insurers require pre-approval. * Please note however, that it is your responsibility to ensure that your health fund allows for you to claim the massage rebate. Different providers offer different levels of cover depending on which package or premium you have taken. In many cases only Remedial Massage treatments are deemed claimable from your Private Health Fund, however this may vary depending on your level of cover. ﻿The following funds can be instantly claimed at the clinic with the HiCaps system. ​Other health funds such as HCF and other regional health funds require manual processing and we are happy to provide receipts to help you claim. 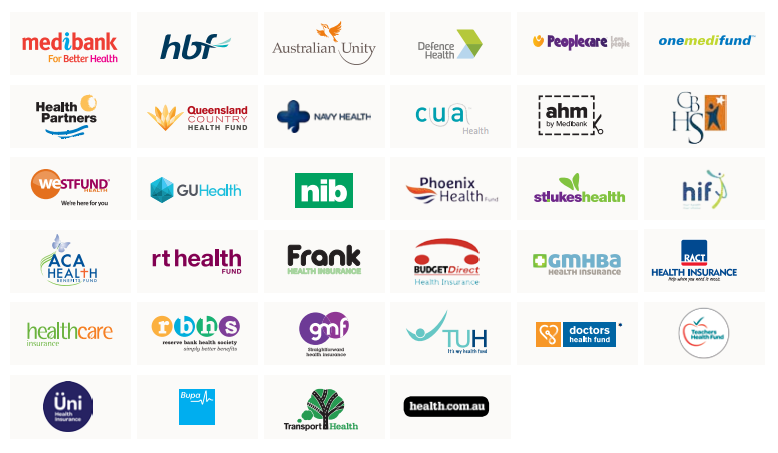 Please contact the clinic for our full health fund list and to check if you are covered. Please note that not all Bodyharmonie therapists are covered for all health insurance claims. ​Please see our therapists page, or contact the clinic for more details. We provide the best massage in Sydney and the Inner West - Marrickville, St Peters, Enmore, Newtown, Dulwich Hill, Earlwood, Kingsgrove, Stanmore, Camperdown, Leichhardt, Petersham, Alexandria, and Lewisham.